My second batch of guacamole for the week, it is sooo good, especially on organic sourdough ciabatta. With a massive amounts of coriander in the garden, I had to find some ways to use it up, it will bolt to seed as soon as the weather heats up. I wonder how long our avocado trees will take to bear fruit? We'll be able to use our own tomatoes and chillies in it soon. Just a few of my op shop/second hand shop scores this week. Andrew will be right for shorts this summer. I also found him a couple pairs of pants in good condition, as he wears out the inner thighs of his pants by riding his bike to the train station. Even hemp canvas pants! I'm finding it much more exciting and satisfying to shop in op shops these days (you just have to do it regularly), shopping centres/malls just don't do it for me anymore, they seem so artificial, and just reminds me how consumeristic our society is, dragging home bags of crap. If I venture into one of those cheap department stores, I'm disgusted at how cheap and nasty the items are, and I can't stop thinking of the poor people who work in sweatshops to make it all for the western world. "Live big for less", just gets my goat. 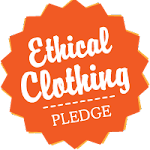 Well you can live more ethically by purchasing second hand when you need it, or by buying handmade, or from places you know treat their workers well and pay them fairly. Buying second hand doesn't mean you're poor (and so what if you are? ), many people can't get past that idea, ingrained from decades ago. I was going to buy Evie a new bike for Christmas, but found 2 matching ones at a second hand shop this week, the 2 for about half the price of a new one. One was bigger than the other, so both of our girls should get a few years of riding out of them, and they were in pretty good condition. By saving a few dollars here, and there, we can spend more on ethical items such as these. Anyway, a mixed up and rambly post that I had to get out of my head. Your thoughts? Rainbow chard, coriander, lettuce, strawberries. Will be making guacamole tomorrow with the coriander, and some limes given to us. Can't wait! Rainbow chard, garlic, leeks, lettuce, chives, oregano, nasturtiums, avocado tree, dwarf apple & pear trees. Raspberries, passionfruit behind. Everything looks better with a fresh layer of mulch. Rainbow chard, strawberries, lettuce, coriander, sweetpeas. I'm finding a bit more time to get out into the garden these days (when I'm not sewing! ), and the kids are enjoying getting out there with me. We planted some more lettuce today, to replace a few that got eaten by wee beasties, and to provide a succession of plants. We also planted some sunflower seeds, but into punnets to keep inside on the laundry windowsill- a bit warmer and protected at this time of year. They usually get eaten as soon as they push through the soil, or blow over in the windy weather. Might plant them in the front yard this year. I also squeezed the juice from 5 small oranges today to make a small glass of orange juice- sooo good! Bec is the lucky winner of $30 to spend in my shop! I have emailed you, now you can make your choice of prize. Thanks to all who entered, it was lovely to read all those comments.